Set a date for the wedding, then start looking for venues. Booking your venue as early as possible vastly increases your chances of getting the day you want. Once you’ve got an agreed date, start making out your guest list. Have a firm one and a ‘reserve’ list, so you can invite more people you’d like to have if others drop out. You’ll need a rough idea of numbers from the outset, as suppliers including photographers and caterers will want to know the figures. Decide on your budget. You can’t book anything without knowing how much you can afford to spend, so this is an absolute must-do before you begin preparations. It’s time to make the big decisions about the style of your wedding. Start thinking about the sort of flowers you want to have, the style of photos, the type of wedding banquet and the variety of cake you want to order. Research suppliers in your area by using wedding magazines, online directories and the good old phone book, as well as talking to friends to see if they can pass on any useful contacts. Set up appointments to meet as many suppliers as possible this month and early next, so you’ve got time to shop around and make the right decision. You should have completed your research by the middle of this month, so pick up the phone and make firm bookings if you haven’t done so already. Good florists, photographers and caterers get snapped up quickly and it’s no good leaving it any longer than this if you’ve got your heart set on a particular company. If you want your dress professionally made, start looking around for a dressmaker. Attend consultations this month so you can settle on the right person and discuss the style of your dress with them. You should also shop for accessories to go with the gown – shoes, underwear and jewellery – so you can take them along to fittings and check everything goes together. Now’s also a good time to get your bridesmaids together and start discussing the style of their gowns. You’ll need a bit of time to find a dress everyone can agree on, as well as time to synchronise diaries for gown fittings. Order your invitations from the printers. They will take at least three months to be ready for collection, and then you’ve got to fill them all out and send them three months before the big day. It’s also handy to have some time in reserve in case there’s anything wrong with the proof versions. Brides having their wedding dress made for them need to attend their first fitting. Book up appointments for future tryings-on and add them to your calendar well in advance. Don’t forget to get the bridesmaids along for their fittings as well. Start shopping around for a hairdresser and make-up artist to make you gorgeous on the big day. Once you’ve settled on people you like, make appointments for trial sessions so you can make adjustments to the finished look. Grooms take note – it’s time to get your mates together and head off to the hire shop to rent your wedding attire. Take fabric swatches of the bride’s dress and bridesmaids’ outfits, as well as any flowers or accessories, to give staff a good idea of the colour scheme you’ll be following. Send out your invitations. You need to give people plenty of time to respond, as well as time to send invitations to anyone on your reserve list if you find you’ve got spare seats you’d like to fill. Set up a meeting with your chosen florist to make final decisions on seasonal flower choices and arrangements. Take members of your wedding party along for a tasting with the caterer, so you can ensure the food’s what you’re expecting and not likely to upset anybody’s stomach. Chief bridesmaids and best men should start thinking about the stag and hen nights in this month. Agree a date with the bride, get your guest list together, phone round to confirm availability and then – and only then! - start thinking about where you want to go and what you’d like to do. Book up your beauty appointments for the week before the wedding – manicures, pedicures, self-tanning treatments and everything you need to be ultra-groomed on the big day. 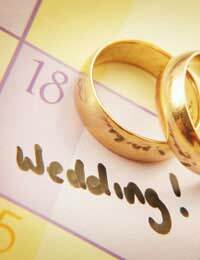 Don’t book anything for the day before the ceremony, as you’ll need contingency time to put any mistakes right. Final dress fittings for you and the bridesmaids need to be completed so the dressmaker’s got time to alter anything that needs changing. Post your notice of marriage. Couples having a civil ceremony need to post this document, containing the names, ages, occupations and nationalities of the people to be married, at the registry office at least 16 days before the date of the wedding. Confirm your flight and hotel bookings for the honeymoon with the travel agent. Discovering you’re double-booked can put a real damper on wedded bliss. Finally, put a couple of big crosses through the days before the wedding. You’ll have worked very hard to get to this point, and it’s vital you get in some R+R before the ceremony if you don’t want to be whiter than your dress. Make a pact with yourself that you won’t do any organisation at all in the days before the ceremony and start anticipating your life as a married lady!